Are comedies meant to end happily? We’re often told this, but it’s easy to cite examples that don’t fit the bill. In Shakespearean comedy, we are left with unaccommodated figures like Shylock or Malvolio, while in Love’s Labour’s Lost death postpones the expected marriage. Jonson’s Volpone ends with punishment and the happy ending of Marston’s Antonio and Mellida turns out to be a ruse: in the tragic sequel, Antonio must avenge Mellida’s death. Renaissance dramatists devised a variety of ways to undercut the assumption that a comedy ends happily. To the long list of established comic undercutting must be added The Fair Maid of the Exchange, a curious play, of uncertain authorship, which was given a deserved outing in the form of a staged reading sponsored by the Malone Society and hosted by Somerville College, Oxford. A terrific cast, assembled at short notice by Edwina Christie and directed by Gerald Baker, used the full space of the Flora Anderson Hall to deliver a subtle and surprising production. As the illuminating post-show symposium discussion demonstrated, there were a number of points of interest: in the first session Martin Wiggins addressed the difficulties in attributing to the play a date, author, or playing company, Katherine Duncan-Jones discussed the play’s allusions to Shakespeare, Susan Anderson focused on the representation of disability, Tim Smith-Laing (who played the character known as ‘the Cripple’) talked about his experience acting in the play, and Baker commented on his experience directing it. 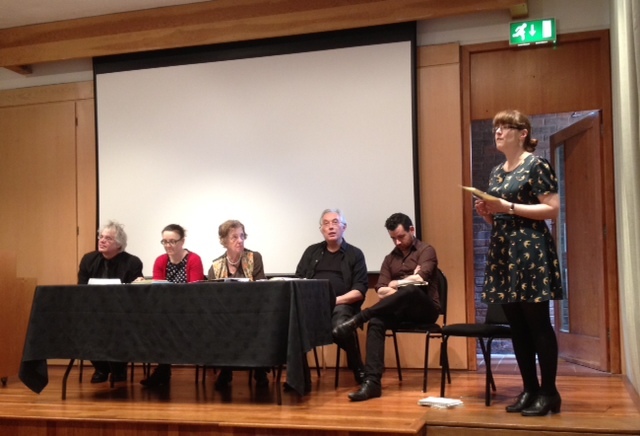 L-R: Martin Wiggins, Susan Anderson, Katherine Duncan-Jones, Gerald Baker, Tim Smith-Laing and Lucy Munro. Photo credit: Jackie Watson. In the second session, Susan North offered an illustrated account of Jacobean embroidery and Rebecca Tomlin analysed the place of commerce in the play. In this post, however, I want to focus on the play’s oddly abrupt ending, which was so skilfully handled in the staged reading. It’s first necessary to offer a brief and partial plot summary. In the play, two brothers, Antony (Peter van Dolen) and Ferdinand Golding (Ariel Levine) pursue the titular fair maid, the pleasingly alliteratively-named Phillis Flower (Edwina Christie). Phillis loves neither man but instead apparently unrequitedly loves the Cripple (Tim Smith-Laing) who, at the play’s outset, had bravely defended Philis and Ursula (Constance Greenfield) from an attack by the outlaws Bobbington and Scarlet (effectively doubled by the actors playing Antony and Ferdinand). 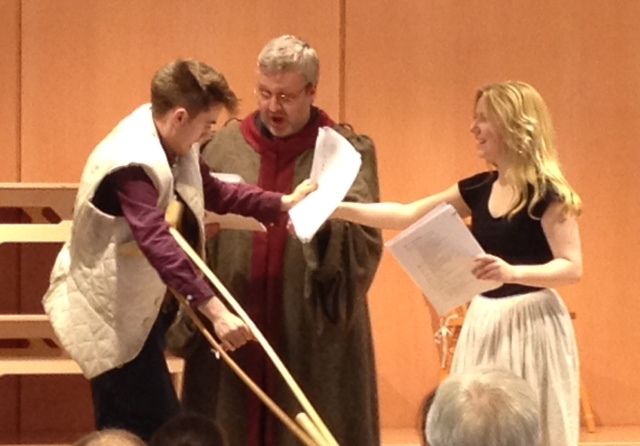 L-R: Constance Greenfield as Master Barnard, Jakub Boguszak as Master Bowdler, Tim Smith-Laing as Cripple and Sophie Duncan as Mall Berry. Photo credit: Jackie Watson. A third brother, Frank (Luke Rollason) also falls in love with Phillis but manages to hide his affection from his brothers. Calling upon a favour from the Cripple, he helps manipulate the situation to suit his own cause, winning the support of Master (Simon Tavener) and Mistress Flower (Lynn Randall) in the process. In the final scene, when the plot is revealed, Phillis must finally choose who she loves; after reflection, she chooses Frank. On the one hand, this might be seen to be a fairly uncomplicated ending. Antony and Ferdinand have done nothing to suggest that they would be deserving husbands and the Cripple passes up on the opportunity to return Phillis’ love; Frank may be a somewhat underhanded and mischievous fellow, but he is also charismatic and clever. However, the production did a wonderful job of rendering such a reading problematic. The image of Phillis, surrounded by suitors, wavering before choosing Frank, was an evocative one. In the post-show discussion Tim Smith-Laing hinted at the difficulties in deciding how to play the Cripple’s reaction. Does he feign his disinterest in Phillis, or is he secretly in love with her? Is he happy about the arrangement? It’s difficult to tell, or for the actor to transmit that information, but the fact that the Cripple is a silent watcher for much of the final scene is instructive. Upon entering, he asks ‘‘Gentlemen sweet bloods, or brethren of familiarity,/I would speake with Phillis, shall I haue audience?’ (TLN 2587-8) He does not have audience; these are in fact, the last words he speaks in the play and the rest of the ending is played out around him. Some may feel glad about the prospective union of Phillis and Frank, but several spectators commented on feeling like the fair maid had made the wrong choice. There may, then, already be misgivings among the audience before the final revelation, which causes a postponement to the festivities. Master Flower, the father of the bride-to-be, is unexpectedly arrested for (unknowingly, as it happens) possessing a stolen diamond. The play ends in infamy, as Flower says: ‘Words here are little worth, wife and friends all/Goe with me to my tryall, you shall see/A good conceit now brought to infamie’ (TLN 2690-2). In the day’s final discussion session, Caroline Barron suggested that this ending might offer a critique of the dark side of commerce; Flower is implicated in this seedy business even if not completely aware of his transgression. Again, the staging here drew out brilliantly the strangeness of the ending. The accusatory lines, spoken by Master Wood, were here delivered, to general surprise, by an audience member, Richard Proudfoot. The metatheatrical playfulness was certainly funny, but this staging also emphasised the jarring nature of the ending. The strangeness of his appearance may partly be to do with cuts made to the text, which slightly obscure the backstory of the diamond, but it was a smart and effective way to conclude this curious comedy. In the printed text, as well as in the performance, Wood emerges, like an inverse deus ex machina, not to solve a convoluted problem, but to cause one. I am absolutely thrilled to read Eoin Price’s post, with some well chosen examples of Jackie’s iPhone photos, which come across beautifully. It’s a particularly thoughtful analysis of this strange but fascinating play, and one which prompts me to make a confession. In order to get the play performed within 2 hours- which was essential for the one-day-event time-table- I spent a couple of weeks cutting about 900 lines from the text- mostly by shortening speeches, but partly by omitting whole scenes. I decided early on that the short closing scene in which Master Flower is called to trial was too downbeat, following on from the previous scene’s disappointment for Mall Berry, who is manipulated into marrying the slightly colourless Barnard rather than the unfailingly witty Bowdler. I even had plans to let the Bowdler actor to perform a little dance and/or song to send the audience out happy – there are several allusions to Bowdler’s good dancing. But I am now absolutely convinced that our excellent Director, Gerald Baker, was completely right to re-instate that ‘surprise’ ending, which in any case follows on from the conjugal disappointments of the long penultimate scene that precedes it.